An artist’s impression of what the Great Pyramids and Sphinx of Giza may have looked like when they were originally built. 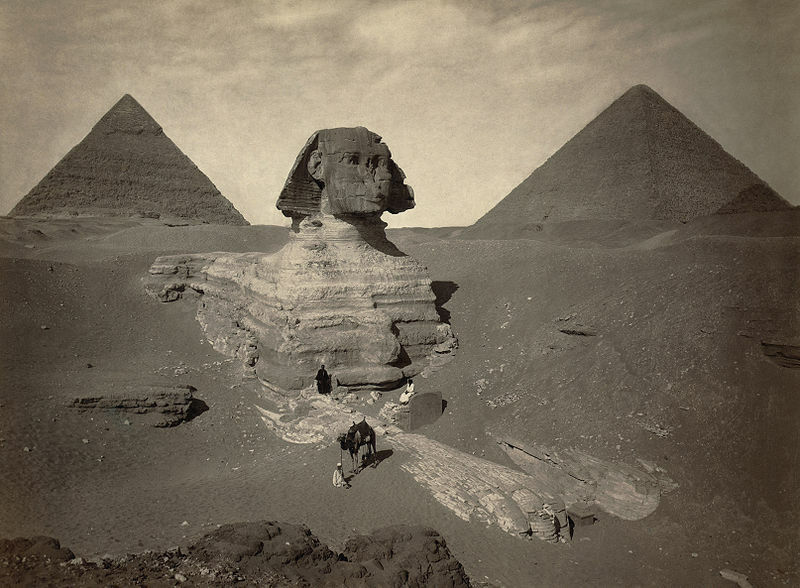 Note that the water surrounding the sphinx actually formed a sacred lake that would have submerged half of its body. The meaning of the Great Sphinx and Pyramids at Giza, Egypt, has eluded the many attempts to understand it using science alone. The peoples who built the Giza site were obviously deeply interested in spirituality. The culture that followed in ancient Egypt, perhaps more than any other, used the intuitive language of symbolism to convey profound spiritual truths—those who had enough inner wisdom could speak this language, while those who did not were rendered incapable of deciphering it. This is why the site at Giza has remained a mystery to most, even though it is one of the most studied sites in the world. To discover the meaning of the Giza site requires a knowledge of the meaning of the spiritual symbols used in its design. The spiritual knowledge which the builders of the Great Pyramids and Sphinx possessed is timeless, and thus it is possible to unlock this site’s meaning through the understanding of this same universal knowledge today, which has found its expression in different forms and cultures in ancient history. The enigmatic and mysterious Sphinx, great centerpiece to this site’s design, holds much of the answer. In this chapter, we will go back as far as possible into the origins of the Sphinx to explore its meaning, using the understanding of the sacred knowledge of the ancient builders. The Great Sphinx being excavated, starting in 1817 AD. Its paws are already covered in restoration stones from Roman times and its head is obviously too small in relation to the size of the body, indicating it was re-carved at least once. To understand the meaning of the Sphinx, we need to firstly uncover its original form, as the form it takes today is the result of multiple restorations dating from at least 1400 BC. Anyone who studies photos of the Sphinx can see that it is out of proportion. Its head is much too small for its body, and is far less weathered than the rest of the body and surrounding enclosure. Its head has obviously been re-carved, perhaps numerous times, and its body has been covered with restoration stones dating from thousands of years ago right up until today, giving the Sphinx its leonine shape while masking its original form. So to find the clues as to what it originally was, we have to look further than the Sphinx alone. 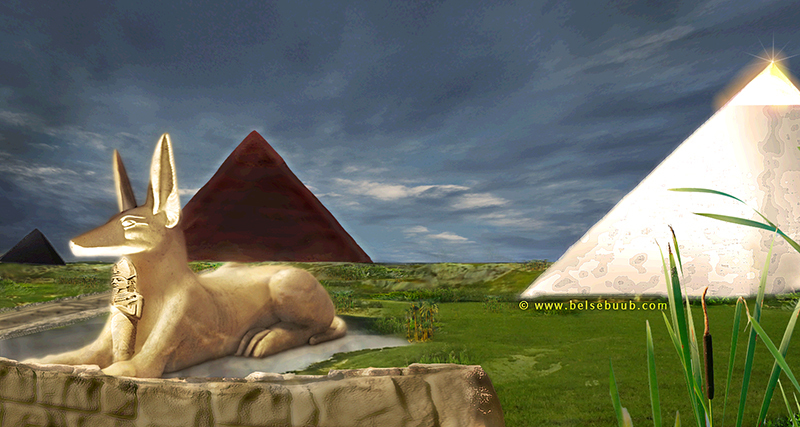 A study of the archaeology, astronomy, and esoteric messages contained in the structures, objects, and art of the Giza Plateau and Sphinx, point to the Sphinx originally being sculpted as the ancient jackal/dog deity Anubis, facilitator of the process from death to resurrection, agent of cosmic law, and gatekeeper of the passage to immortality. The Pyramids Texts, carved into the stone walls of the pyramids at Saqqara in Egypt, date from around 2400 BC and are currently the oldest dated sacred texts in the world. 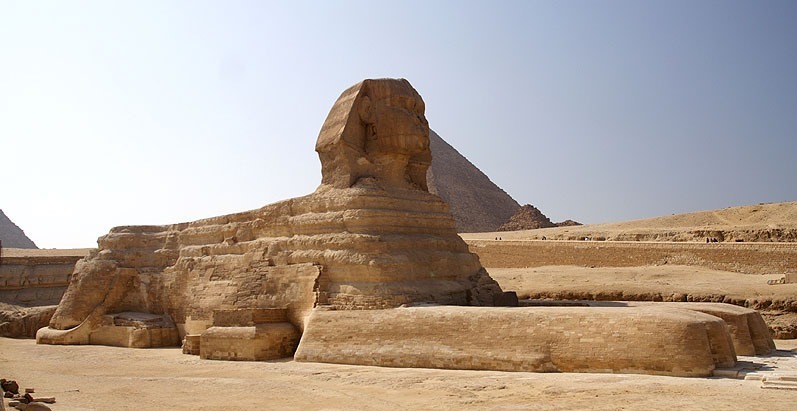 They contain the earliest references to the Great Sphinx and Pyramids of Egypt, and indicate that the Great Sphinx once took the form of the Egyptian god Anubis. In ancient times the site of the Great Pyramids, where the Sphinx lies, was called Ro-Setawe, the Sacred Land and the Necropolis, and the Pyramid Texts refer to Anubis as “Lord of Ro-Setawe,” “Anubis who presides over the Sacred Land” (and also Pure Land, and Secluded Land), and “he at the Head of the Necropolis,” which are all ancient references to Anubis standing guard over the site of the Great Pyramids. This may not have been just a metaphysical reference, but a very physical one, as the Sphinx does indeed stand at the entrance to the site of the Great Pyramids. 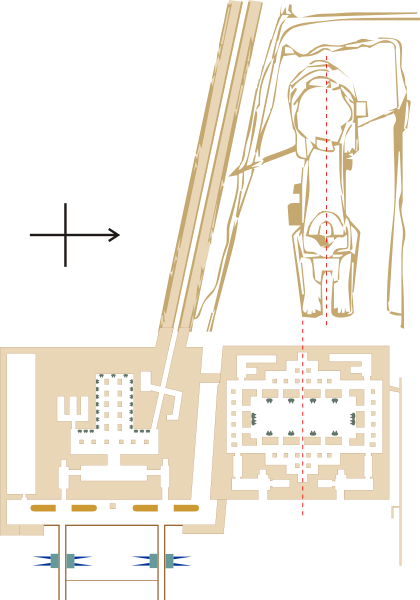 This diagram shows the Sphinx from above. Directly in front of it is the Sphinx Temple, and to its right is the Valley Temple, which has two quays protruding from it (the ones with the blue spikes) which would have brought people into the Giza site by boat and formed the entrance to the entire Giza plateau. A causeway leads from the Valley Temple (offset at 14 degrees due east) past the Sphinx. The waters of the river Nile would have also reached into the area around the Sphinx, creating a sacred lake. The area around the Sphinx was dug out to create the lake, and the giant blocks excavated used to build the Sphinx and Valley Temples. In ancient times, the Giza site would have been entered by boat as the river Nile reached right up to the Sphinx. Boat quays were discovered protruding from the Valley Temple beside the Sphinx (which was built out of the stones excavated from around the Sphinx when it was first created). Anyone who entered the Giza site had to pass by the Sphinx by arriving via boat and passing by the great statue along a grand causeway leading to the Pyramids. Modern researchers Robert Temple and Olivia Temple have done a great work in uncovering and bringing together the archaeological, textual, and historical evidence for the Sphinx being Anubis in extensive detail in their book The Sphinx Mystery, but not only does the archaeological evidence point to Anubis being the original form of the Great Sphinx, it also ties in with the same kind of spiritual knowledge that is universally represented throughout cultures around the world and in the most ancient sacred texts of Egypt. Although recognized by millions, the Sphinx has remained an enigma; but by knowing its original form and understanding the principles of esoteric knowledge, its symbolism may be understood and its message decoded. Aligned to precise cosmic events, lying atop of hidden chambers, surrounded by a sacred lake, and part of an incredible master plan that incorporates the Great Pyramids using advanced geometry, the Sphinx is a monument of magnificent wisdom and scale that symbolizes the attainment of imperishability through resurrection. The Great Sphinx aligns to the spring equinox, a time of spiritual resurrection as found in the design of many other ancient sites throughout the world also aligned to this solar event. One of the central spiritual teachings of Egypt is the life of Osiris, which reveals the process of attaining enlightenment—or imperishability as it is called in Egyptian texts. Like Jesus, Osiris is killed and is then resurrected. It is the god Anubis who resurrects Osiris, and who thus formed a central symbolic part of the design of the Giza Plateau and the statue dedicated to this momentous spiritual event. The Sphinx. In this photo the restoration block-work on the body of the sphinx can be seen clearly, in multiple layers, revealing beneath it a very weathered original stone. Concrete has been used to fill in the headdress as well as deep rivets in the body. Horizontal signs of weathering can be seen on the wall behind the sphinx that would have enclosed a lake (photo CC BY-SA 3.0 by Marek Kocjan). Anubis attending the initiate who lies symbolically dead, to resurrect them. In the sacred teachings of ancient Egypt, a person had to undergo a defined spiritual process to pass from mortality to immortality, which led from death to resurrection. Resurrection as a spiritual process can be found in ancient sacred teachings throughout the world and is associated with the time of the spring equinox—the most dominant solar alignment of the Giza Plateau, which the Sphinx gazes precisely toward. Resurrection was central to the life of the Egyptian god Osiris, just as it was in the lives of Jesus, Tammuz, Dionysus, Attis, Mithras, the Maize God Hun Hunahpu of the Mayans, etc., who all resurrected at the time of the spring equinox. The lives of these deities, although appearing in different cultures and times, symbolized the same universal spiritual process also symbolized by the Great Sphinx of Egypt, one of the most ancient and mysterious sacred sites in the world. Each of these deities showed the events and processes involved in reaching enlightenment, which is why they contain so many similarities. Resurrection is always preceded by death—both Jesus and Osiris were betrayed and killed before they were brought back to life to live eternally. In Egypt, Anubis has a central role in death and resurrection. In the life of Osiris, Anubis resurrects Osiris after he is betrayed and killed by his evil brother Seth. Anpu (Anubis in Greek) is one of the most ancient gods of Egypt—the record of his veneration pre-dates that even of Osiris. Anubis was depicted as a black recumbent jackal, or as a man with the head of a jackal, and presiding over the process of death. The jackal head is a sacred headdress Anubis wears in his role in the spiritual realms. In Egypt, Anubis most famously appears in the scene of the weighing of the heart, illustrating events after death. The heart of the deceased is weighed by Anubis on the scales of divine law (called Maat, which is cosmic order) against a feather to determine how they lived their life, and based on that, what would happen to them next. This is an illustration of Anubis in his role as the head judge of divine law and justice, which he administers along with the other forty-two judges of the divine law, known in ancient Egyptian texts as “The Assessors of Maat” and the god Thoth, also depicted in this scene. The god Anubis weighs the heart of the dead in the presence of the god Thoth and the 42 judges of karma, before Osiris who after his resurrection, becomes judge of the dead. This signifies how the initiate (Osiris) achieves becoming a judge through fulfilling all divine laws, and is no longer judged by Anubis, head of the divine law. 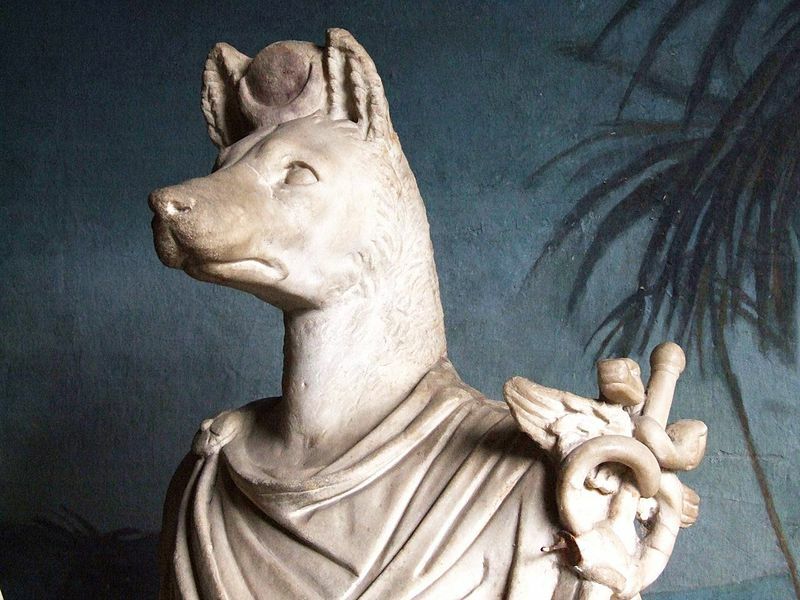 The god Hermanubis – who was a merger of the Greek god Hermes with the Egyptian god Anubis. Resting on his left shoulder is the caduceus of Mercury, which is an alchemical symbol of two serpents entwined around a winged staff (photo CC BY 2.0 by gnuckx). In Greece Anubis became the god Hermes, and even merged to form the god Hermanubis, whilst in Rome he became the god Mercury. Both Hermes and Mercury were considered guides of the dead, and were depicted with winged sandals. Mercury was depicted holding a caduceus, which is a winged staff with two serpents entwined around it, and Hermes with a winged cap. In out-of-body experiences, Anubis can also be seen wearing wings upon his head. Anubis not only has a role in receiving the dead and judging them, but also in the esoteric process of inner death. Resurrection is always preceded by death, but this death is not a physical one, it is an inner one which takes place as part of a spiritual work. It involves the death of all that is evil, inferior, and dark within oneself, such as hatred, anger, jealousy, lust, etc., in a process of psychological and energetic purification. In Egypt this turned into a religious belief (as it has happened in other religions) misinterpreted by later generations of people who had lost the ability to understand the esoteric meaning of Egypt’s sacred texts. Pharaohs believed instead that their physical death would lead to physical resurrection in the afterlife, surrounding themselves with jewels and spells that would apparently assure them safe passage in the journey to reach immortality. However, the esoteric death is inner and its resurrection is achieved in life through a spiritual and alchemical work, and the Great Sphinx and life of Osiris, along with the life of many other deities, symbolizes how it takes place. Anubis in his recumbent form lying atop a coffin. This statue was found in the treasures inside the tomb of Tutankhamun (photo © by Jon Bodsworth). The reference to the site of Giza being the place of the dead is not a reference to it being an actual graveyard (although the inhabitants of the site later interpreted it this way), but as a place of those who achieve an inner, psychological death. This finds its parallel in the Place of Skulls where Jesus was crucified, and the Avenue of the Dead at the Pyramids of Teotihuacán in Mexico where it is said “men become Gods,” which also shares other similarities. Little wonder that Anubis, the god with a central role in death and resurrection, stood guard over the site of Giza, dedicated to the spiritual process of attaining imperishability, in which death and resurrection were essential. 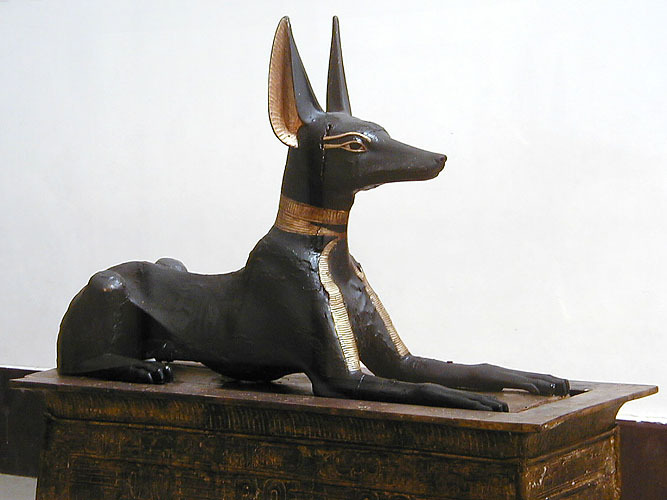 Anubis was also known as the “Master of Secrets,” and was often depicted as a dog or jackal recumbent on a coffin, which was said to contain sacred secrets. Indeed, the Great Sphinx does stand guard over incredible secrets, as beneath it lies nine chambers, each containing an unknown metal object. This is an extract from the book The Path of the Spiritual Sun from the chapter Decoding the Ancient Meaning of the Sphinx and its Origin as Anubis. The Path of the Spiritual Sun aims to synthesize the deeper meaning behind the celebration of the spiritual sun as something that can be practiced today just as the ancients did thousands of years ago. It uncovers the lost threads that connect the very process of spiritual transformation, with the movement of the heavens and the earth, as well as the remaining fragments of ancient spiritual knowledge we have access to today. It describes why so many ancient sacred sites align to the sun’s major annual stages (the solstices and equinoxes), why so many ancient spiritual teachings share similarities with one another and the sun even though separated by great distances, and reveals the common roots behind many of the religions and traditions still practiced today.